Here's what I do to make sure I don't end up with metallic flakes all over my brand new paint jobs. All you need is 2 separate cups for your water... one for regular paints and one for metallics ONLY. I've even gone as far to add a third cup for my brushes that have glue or when I'm putting decals on my guys. While I do not seperate metallics from non metallics I use 2 cups. I get most of the paint off in the first then I use the second one for final cleaning. I also try to change out the water pretty often. I use too two cups like you, for metallics and for normal paints. I prefer to use two cups, but when I've only got one handy, I make sure to rinse it out thoroughly between metallic and non metallic colors. Good call on a separate cup for glue brushes and such! Sometimes I get lazy and rinse my glue bruses out in my metallics water but then I know better and go and change it after that. 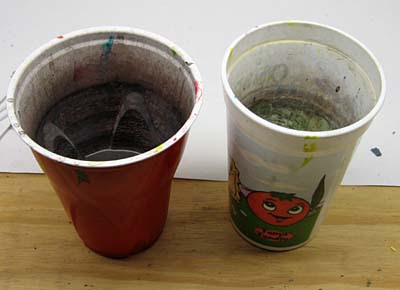 I also use two cups, but I use one for cleaning brushes and the other to pull clean water from to water down my paints. This way I'm not mixing dirty water with fresh paint. I also refresh my water constantly. If I use a metallic paint - once finished I empty and refill before going to another colour. I also do this for dark, bright, and "problematic" colours. For example: if I'm painting red - once finished I'll empty and refill so it doesn't end up putting a red hue on some other colour. I use dirty water for everything, I never thought about keeping one with "clean" water for thinning paint. Thinning paint is great for some things! I have discovered it recently for painting tanks! Nice! I might try that. I recently learned -- the hard way -- the necessity of keeping separate water for metallics and non-metallics. Well, not so much that it affected any painting I was doing, but when I went to (finally) empty my dirty water out, I noticed all the flakes from drybrushing Boltgun Metal. Yeah, yummy. So now, there's two cups of water for me...AND I actually start with fresh water every painting session! Call it a double bonus. Tried that last painting session and I will keep doing it, it really helps. Actually I have now switched to two sets of brushes, one for metallic paints and one for non-metallic paints. And brushes that are mostly spent get used for glue and stuff like it before going into the thrash. LegenMythMan: Very good point. I too have separate brushes for glue, drybrushing, applying powders, etc. I have been using the same rinsing cup for years. I just change the water whenever I drastically change the paint color. ObsidianXIII: Once i started using separate cups for metallic colors, there was no going back. I hated getting little flecks of metallic color in my other paints.